The NFL Players Association’s athlete-driven accelerator, OneTeam Collective, hosted its third annual pitch competition on January 30, 2019, at Switchyards in Atlanta, where a select group of 10 innovative early stage startups each made their case to become a portfolio company of the OneTeam Collective and potentially access funding, mentorship and the NFLPA’s exclusive group licensing rights. The entrepreneurs pitched their strategies and cutting-edge technologies and products to Athlete Advisory Board members Kelvin Beachum, Jr., Mark Herzlich, Dhani Jones, Isaiah Kacyvenski, Ryan Mundy, Ryan Nece and Russell Okung; OneTeam Collective Board of Directors; investors; and executives from sports, entertainment and technology. An expert panel of judges – including VP of Licensing at The Brandr Group and USA Women’s Baseball player Malaika Underwood; former NFL player and NFLPA president Eric Winston; NFLPA Deputy Managing Director and Special Counsel Teri Smith; ESPN analyst and Fantasy Life founder Matthew Berry; and Rouz Jazayeri, founder of Catapult Ventures – questioned the prospects following their pitches and evaluated potential impact in the market and future opportunities for growth. This year’s winning pitch came from organic baby food maker, Fresh Bellies, a revolutionary brand first-to-market with an innovative philosophy to tackle the epidemic of childhood obesity. Fresh Bellies, founded by former NBA marketing executive Saskia Sorrosa, targets change in a dated baby food industry that has traditionally offered bland flavoring with a disproportionate and unhealthy amount of fruit-to-vegetable ratio. The new line of organic baby food is reshaping the business through palate development and utilizes vegetables and herbs and spices as seasoning, which shapes nutritional preferences early on and encourages healthier choice later in life. As the winning pitch, Fresh Bellies received $25,000 in NFL Player marketing credit that can be used for activations and player endorsements, and will obtain consulting services from OneTeam Collective founding partner, CSM LeadDog. By virtue of having the winning pitch, Fresh Bellies will also have a priority opportunity to become a portfolio company. A standing room only crowd also had a vote for their favorite pitch via the NFLPA event app. The winner of the audience vote was TheCut, a lifestyle brand that is modernizing the barbershop experience by connecting barbers and clients via an intuitive app. As audience favorite, TheCut was granted $15,000 credit for potential NFL Player activations and involvement. Each company that pitched the OneTeam Collective will still have a chance to become portfolio partners. Other startups that pitched at this year’s event, included: mobile sports auction company, Collectable; Artificial intelligence company, Genies; online crowdsourcing platform, GivingSquad; esports app, ReadyUp; smart performance wear company, Strive Tech; fantasy sports gaming platform, The Crown League; intelligent fitness system, Tonal; and STEM learning active play company, Unruly Studios. The previous winning pitches, and current OneTeam Collective portfolio partners, were Artificial intelligence augmented video company Octi (2017) and wearable tech brand, Whoop (2016). The sports industry’s first athlete-driven business accelerator for innovative companies seeking to incorporate sports strategies to drive growth. OneTeam Collective (oneteamcollective.com) is comprised of founding partners – NFLPA, BlackRock, Harvard Innovation Lab, Intel Capital, Kleiner Perkins Caufield & Byers, CSM LeadDog, Madrona Venture Group and Sports Innovation Lab. The collective offers access to the NFLPA’s player membership via licensing, marketing and content rights, research and development, funding and mentorship for product development and marketing support. OneTeam Collective, which features an Athlete Advisory Board, is the first program providing rights to sports-related intellectual property, highlighted by the NFLPA’s exclusive group licensing rights and access to more than 2,000 current NFL players. Currently, nine partners are within the portfolio, spanning blockchain, wearables, voice recognition, digital media, augmented reality, artificial intelligence, health and wellness, active gaming and live video streaming. The NFLPA via its athlete-driven accelerator, the OneTeam Collective, announced a partnership with Hashletes, a blockchain-based app that combines digital collectibles with a new gaming experience. Hashletes is one of the first companies to launch a practical, consumer-facing use for blockchain technology, and has secured licensing rights and access to 2,000+ current NFL players through this partnership. At the core of the product are 25,000 collectibles associated with each player, with fans able to buy, sell, and trade the tokens with other fans. Hashletes has similarities to both fantasy sports and physical trading cards, with appeal to the younger generation of mobile consumers with an interest in digital stickers, emojis and avatars. Much in the same way that collectible games like Magic: The Gathering or Pokémon have captured mass appeal, Hashletes can provide the same kind of experience for NFL players and a mobile audience. Hashletes is one of nine current partners in the OneTeam Collective portfolio, which spans a broad range of categories including blockchain, wearables, voice recognition, digital media, augmented reality, artificial intelligence, active gaming and live video streaming. NEW YORK CITY — JULY 31, 2018 — SportsCastr, a live-streaming platform that allows anyone to become a color commentator, announced today that the NFL Players Association (NFLPA), via its athlete-driven accelerator the OneTeam Collective, has acquired a minority stake in the company to power live, interactive video content for fans. Through this partnership, active and former NFL players will use SportsCastr to provide live commentary across a wide range of professional and collegiate sports, share personal insights, and more. ACE Media, the NFLPA’s content and production arm, will collaborate with SportsCastr to produce NFL player and other athlete-driven content featured on the SportsCastr platform. As part of this agreement, SportsCastr becomes an official licensee of the NFLPA in the categories of mobile apps and web-based platforms that allow users to discuss a variety of sports topics, including through video streams and chats. SportsCastr is the eighth active NFLPA partner secured through the OneTeam Collective, which is designed to give innovative early stage companies the opportunity to leverage the NFLPA’s exclusive group player rights, in exchange for equity. Athlete Content & Entertainment Media (ACE Media) identifies and develops unique content opportunities for athletes, and leverages unparalleled access, rights and events to highlight their interests, passions and talents, and deliver compelling sports-lifestyle content projects across a variety of platforms. Since its inception in 2015, ACE Media has produced, created or facilitated over 1,750 unique content features and projects in collaboration with more than 1,200 unique athletes from a variety of professional sports. For more information, please visit acemediaco.com. 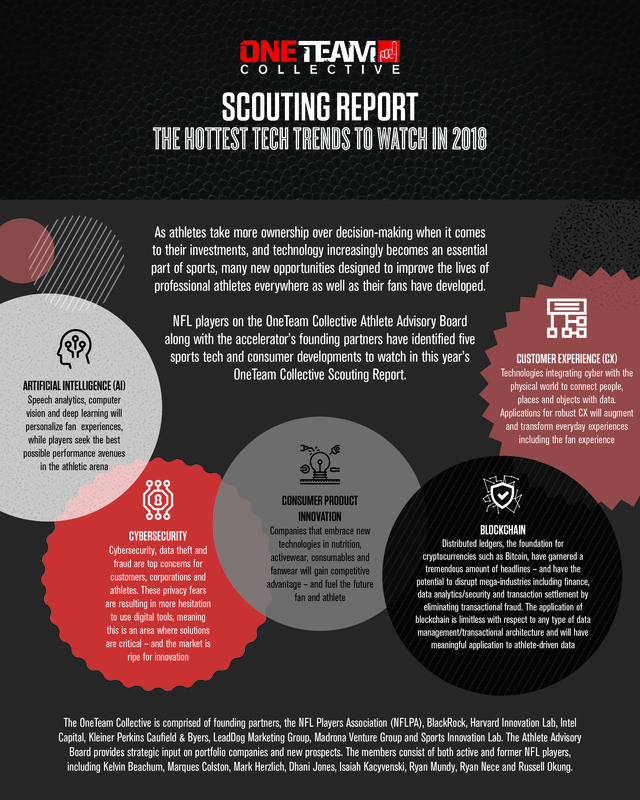 LOS ANGELES – July 12, 2018 – Octi, an augmented video company leveraging machine learning and computer vision to make your world more interactive, announced today that it has entered into a strategic investment and partnership with the NFL Players Association (NFLPA) via its athlete-driven accelerator, the OneTeam Collective. The partnership will enable fans to create videos where they interact with NFL player avatars. Octi will create and commercially distribute avatars for more than 2,000 active NFL players. Octi also announced a seed round of $7.5M with participation from Shasta Ventures, I2BF Ventures, Bold Capital Partners, Day One Ventures, Human Ventures, Live Nation, and AB InBev. A host of industry leaders also joined the round including Tom Conrad, former VP of Product at Snap Inc.; Shiva Rajaraman, Chief Product Officer of Technology at WeWork; Scott Belsky, Chief Product Officer of Adobe; Abbe Raven, Chairman at A&E Networks; and Joshua Kushner. The company’s first app, also entitled Octi, allows users to augment themselves, their friends, and their worlds. It uses the human body as a new medium for an evolution of storytelling, just as GIFs, emojis, and face filters once revolutionized mobile communication. Octi’s proprietary skeleton mapping and gesture detection technology uses a smartphone camera to recognize the human body without additional sensors and automatically overlays contextual 3D effects, allowing users to be anyone — or anywhere — with their friends. The technology recognizes what’s happening in real time with a human body, interprets gestures, and understands spatially where a person sits in a room or scene. The company plans to use the funding to continue building out its team of computer vision scientists, researchers, and machine learning engineers. The new round will also enable Octi to pursue integrations of its proprietary augmented video technology by third-party companies and mobile applications across industries such as fitness, gaming, and fashion. Octi won the top prize in player marketing and consulting at the NFLPA’s OneTeam Collective Pitch Day in Minneapolis in January 2018. The Pitch Day featured ten companies that sought funding, consulting and access to group licensing rights, selected from more than 400 applications. The selection process was managed by the NFLPA with input from its OneTeam Collective athlete advisory board — which includes current and retired NFL players — as well as executives from OneTeam Collective founding partners, BlackRock, Harvard Innovation Lab, Intel Capital, Kleiner Perkins Caufield & Byers, LeadDog Marketing Group, Madrona Venture Group and Sports Innovation Lab. “The NFLPA and the OneTeam Collective are constantly looking to collaborate with the newest consumer technologies, and we were impressed by Octi’s team and the new platform they have built to change the way we communicate through video. Octi’s mobile AR technology creates a wide range of opportunities for players and fans. We are incredibly excited about our investment and partnership with Octi,” said Ahmad Nassar, President of NFL Players Inc. and Chairman of the Board of the OneTeam Collective. Octi is the seventh NFLPA partner secured through the OneTeam Collective, which is designed to give innovative companies the opportunity to leverage the NFLPA’s exclusive group player rights, in exchange for equity. “Octi represents a leap forward as a technology platform by empowering the camera to understand full body movement and gestures. I’m excited to see the range of fun and meaningful interactions that arise from this new capability,” said Shiva Rajaraman, Chief Product Officer of Technology at WeWork. Octi is a company of computer vision scientists, researchers and machine learning engineers making everything in your world interactive. The company’s flagship mobile application, OCTI, allows users to augment themselves, their friends, and their worlds by using the human body as a new medium for communication. Octi was founded by Justin Fuisz, an award-winning entrepreneur in the augmented video and computer vision industries, and Drew Martin, a serial entrepreneur with extensive experience in operating video-centric companies. Octi is headquartered in Los Angeles. For more information, please visit http://www.octi.tv/. The OneTeam Collective is the first athlete-driven business accelerator for innovative companies seeking to incorporate sports strategies to drive growth. OneTeam Collective is comprised of founding partners, the NFL Players Association (NFLPA), BlackRock, Harvard Innovation Lab, Intel, Kleiner Perkins Caufield & Byers, LeadDog Marketing Group, Madrona Venture Group and Sports Innovation Lab. The Collective offers access to the NFLPA’s brightest stars via licensing, marketing and content rights, research and development, funding and mentorship for product development and marketing support. OneTeam Collective, which features an Athlete Advisory Board, will be the first program providing rights to sports-related intellectual property, highlighted by the NFLPA’s exclusive group licensing rights and unparalleled access to more than 2,000 current NFL players. Prospective companies can apply to participate and submit their application at www.oneteamcollective.com. SEATTLE (June 27, 2018) – Play Impossible, creators of the acclaimed Gameball™ active gaming system, today announced a strategic partnership with the NFL Players Association (NFLPA), via its athlete-driven accelerator, the OneTeam Collective, to integrate NFL players into new games, collaborate on future products and promote active play and S.T.E.M. learning for kids and families worldwide. Play Impossible also announced that, in addition to the iPhone and iPad, for the first time Gameball supports play on Apple TV 4K and Apple TV (4th generation). The Seattle-based startup is on a mission to re-ignite the simplicity and joy of face-to-face play with its flagship product, the Play Impossible Gameball. The inflatable, durable ball that connects via Bluetooth to the Play Impossible app, bringing connected ball games with an innovative twist to an all-time favorite play object. The Gameball is recommended for kids and adults alike. Among the types of integration of the NFL players into Gameball games are Player Avatars and Player-Themed Leaderboards. The NFLPA will also work on behalf of Play Impossible to identify select NFL players as brand ambassadors, adding a human element to help connect and create additional layers of competition with Play Impossible users. “As a professional athlete and a father, Play Impossible and Gameball is an exciting game option that connects kids’ passion for tech with the amazing benefits of physical activity – the one of a kind game system combines learning, having fun and staying healthy,” said Kelvin Beachum, New York Jets offensive tackle and OneTeam Collective athlete advisory board member. Embedded with patented sensor technology to bring the digital action both indoors and outdoors, the Play Impossible Gameball has the durability of a beach volleyball and the ability to refuel in just 20 seconds with the Rapid Charger, which will provide hours of fun with each re-fuel. In the backyard and on the go, the Gameball connects to an iPhone or iPad and the Play Impossible Gameball app. The app prompts gameplay, tracks scores and reports progress —and now, with the Apple TV integration, the Gameball can deliver active gaming in the family room, all year long. The Play Impossible app will update with new games throughout the year. Play Impossible is the sixth NFLPA partner secured through the OneTeam Collective, which is designed to give innovative companies the opportunity to leverage the NFLPA’s exclusive group player rights in exchange for equity. The Play Impossible Gameball is available at www.apple.com/shop/product/HM7C2 and Apple Stores in the U.S. and Canada for $99. The Play Impossible app is available for free download from the App Store. For more information, visit www.playimpossible.com and connect on social media by following @PlayImpossible on Facebook or Instagram and @play_impossible on Twitter. SAN FRANCISCO and WASHINGTON – September 7, 2017 – StatMuse, the leader in natural language processing for sports, launched its first app for iOS, enabling fans to interact with sports stars in a whole new way. With the voice app, fans can ask about scores, stats and more, and hear the answers straight from their favorite players. Additionally, the company announced a strategic investment and partnership with the NFL Players Association (NFLPA), secured through the OneTeam Collective, which is designed to give innovative companies the opportunity to leverage the NFLPA’s exclusive group player rights. The StatMuse app changes the game as it relates to the fan experience. Basic questions, like “When do the Falcons play next?” will delight: “This is Devonta Freeman. Yes, it’s really me. The Atlanta Falcons play the Chicago Bears next Sunday at 1 PM Eastern”. Want to know how many yards Jay Ajayi had in that Bills game last season? Jay can tell you: “I had 216 yards against the Buffalo Bills on October 23rd”. With StatMuse’s landmark technology entertainment deal with the NFLPA, the company adds the NFLPA to its roster of top-tier investors, which also includes The Walt Disney Company, Techstars, Allen & Company, Greycroft and David Stern, NBA Commissioner Emeritus. Beyond the breakthrough artificial intelligence technology that powers StatMuse, the company has the most comprehensive sports knowledge base dating back to 1876. With over 700 unique illustrations, the company also boasts the largest library of digital player art. When combined with StatMuse’s original content, the product reflects the brand’s lively personality. As the officially licensed voice app of the NFLPA, the app primarily features the authentic voices of today’s NFL players. StatMuse will be rolling out new voices early this NFL season, along with some of the top rookies of the 2017 class, and looks forward to adding more in the future. Scott Van Pelt, host of ESPN’s SportsCenter, is the first voice covering all three sports in the StatMuse app. StatMuse’s proprietary technology is highlighted by best-in-class language understanding, language generation, and conversational dialog support. To take the product beyond the typical voice platform experience, the company’s engineering and creative teams work together to write scripts and direct talent in the studio to capture the vocabulary necessary to bring these sports personalities to life. ACE Media, the NFLPA’s content and production subsidiary, will be leveraging its player access and extensive production expertise to coordinate and produce all of StatMuse’s audio and visual content. Coming soon to Amazon Alexa. StatMuse Inc. is an artificial intelligence company specializing in natural language processing. Talk with your favorite players and personalities for your daily sports conversations. Keep up with the latest scores, stats and original content about the teams you love through personalized musings. Get instant NBA, NFL & MLB answers back to 1876 and become more than just a fan. StatMuse is the officially licensed voice app of the NFLPA, featuring the voices of Peyton Manning, Jerry Rice, Devonta Freeman, Le’Veon Bell, Deion Sanders, Terrell Owens, Jay Ajayi, Drew Brees and many more. The company was founded in 2014 by two lifelong friends and is backed by top-tier investors, including The Walt Disney Company, Techstars, Allen & Company, the NFL Players Association, Greycroft and David Stern. The company has raised $11.75 million to date. The National Football League Players Association is the union for professional football players in the National Football League. Established in 1956, the NFLPA has a long history of assuring proper recognition and representation of players’ interests. The NFLPA has shown that it will do whatever is necessary to assure that the rights of players are protected—including ceasing to be a union, if necessary, as it did in 1989. In 1993, the NFLPA again was officially recognized as the union representing the players, and negotiated a landmark Collective Bargaining Agreement with the NFL. The current CBA will govern the sport through 2020. For additional details, please visit nflpa.com. Athlete Content & Entertainment Media (ACE Media) delivers unrivaled capabilities and access to develop and package athlete-driven sports-lifestyle content projects for all media platforms, and offers full-service production services. ACE Media leverages the NFLPA’s exclusive group player rights, its 2,000 active player members and its year-round portfolio of events to produce content that showcases athletes, their passions and personalities in ways that go well beyond their statistics and game highlights. ACE has produced, created or facilitated over 1,300 unique content features and projects in collaboration with more than 900 unique athletes from a variety of professional sports. ACE Media has partnered with more than 30 different companies to create content for distribution across all media platforms including television, digital, social and mobile. For more information, please visit acemediaco.com. WASHINGTON, August 30, 2017 – As interest around college football intensifies, the NFL Players Association (NFLPA), in partnership with its collegiate licensing agency, The Brandr Group (TBG) and its production and content arm, ACE Media, today announced the groundbreaking launch of CampusLore, a digital media brand aimed at delivering unrivaled storytelling and analysis of college football– straight from former college stars now playing professionally. Launching on Friday, September 1, CampusLore will feature hundreds of videos on Twitter, Instagram, Facebook and YouTube, and at campuslore.com, with more players and additional school coverage to come throughout the college football season. CampusLore is the first media brand offering college fans content directly from professional players, exclusively supported by the NFLPA through its group player rights in college. With more sports fans choosing to engage with content through non-traditional outlets, and with NFL players maintaining a strong social following composed of fans from their alma maters, CampusLore is well-positioned to connect passionate college football fans with their favorite former players in a new and different way. Fans will have unprecedented access to the NFL players’ untold stories and memories, analysis, and behind-the-scenes insights throughout the college football season. The launch of CampusLore aligns with the NFLPA’s strategy to extend its market leadership to content and media offerings providing unprecedented engagement opportunities between NFL players and their fans. The Brandr Group serves as the NFLPA’s agency of record to exclusively represent NFL player group licensing rights across all categories for collegiate co-brand licensing and sponsorship opportunities. “CampusLore is the next extension of crystallizing collegiate careers and appeal. NFL players are the best storytellers of information about the college game. All NFL players starred in college so CampusLore ideally provides our entire membership with unique opportunities,” said NFL Players Inc. President Ahmad Nassar. “CampusLore connects fans with their favorite players, providing exclusive untold stories, information and analysis they’ve never had access to before,” said TBG Media Lead Lee Bushkell. ACE Media, the athlete-driven content and production company of the NFLPA, will executive produce, consult and handle production services for CampusLore content. The NFL Players Association (NFLPA) is the union for professional football players in the National Football League. Established in 1956, the NFLPA has a long history of assuring proper recognition and representation of players’ interests. The NFLPA has shown that it will do whatever is necessary to assure that the rights of players are protected—including ceasing to be a union, if necessary, as it did in 1989. In 1993, the NFLPA again was officially recognized as the union representing the players, and negotiated a landmark Collective Bargaining Agreement with the NFL. The current CBA will govern the sport through 2020. For additional details, please visit www.nflpa.com. Founded in 2015 by long-time licensing veteran Wesley Haynes, The Brandr Group (TBG) is the NFLPI’s agent of record to exclusively represent NFL players in college licensing and sponsorship programs. TBG’s focus is creating new licensing and content businesses around rights-driven intellectual property. Athlete Content & Entertainment Media (ACE Media) identifies and develops unique content opportunities for athletes, and leverages unparalleled access, rights and events to highlight their interests, passions and talents and deliver compelling sports-lifestyle content across a variety of platforms. Since inception in 2015, ACE has produced, created or facilitated over 1,300 unique content features and projects in collaboration with more than 30 companies and more than 900 unique athletes from a variety of professional sports. For more information, please visit acemediaco.com.